How many adults does it take to prepare the perfect Easter morning? Apparently three. Three very confused adults. We have an Easter tradition in our little family since Lilly was born. Lilly and I fly to New York to spend the holiday with my family so that Lilly can run around with a herd of male cousins hunting Easter eggs and eating obscene amounts of high fructose corn syrup, while Elliott stays home, works and wonders what the big deal is about Easter (besides that little resurrection thing). This year we changed it up a bit. Elliott flew up for Easter weekend and got to witness his daughter embracing the glory of God firsthand — no, no wait, that was a chocolate bunny — the glory of chocolate bunnies. I was pretty excited for the big day. I love the whole Easter Bunny/Santa Claus-type thing. Some parents don’t. They’re not comfortable “lying” to their kids and tend to avoid explanations and elaborate ruses. Not me. It’s go big or go home in this family. Now Easter doesn’t involve quite as much prep as Christmas. There’s no North Pole myth. (Anyone know where the Easter Bunny lives? I need to research this.) No reindeer names to learn. And there’s only one song to speak of. But there is a Bunny to hype and a morning surprise. Leading up to Easter, Lilly and I had been talking and singing about the Easter Bunny and the basket he would leave her. 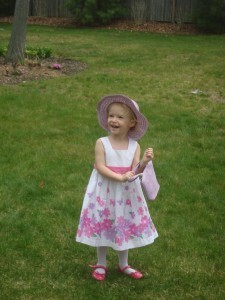 We dyed eggs, bought a Spring-y dress and hat, and took a trip to the mall for pictures with the Bunny himself. Lilly was equally excited about dressing up in her pretty dress and the one morning a year when, I promised, she could eat candy before breakfast. As with Santa, we like to take time to give thanks for the long night of work the Easter Bunny puts in to make little kids everywhere happy by leaving him a snack. So the night before Easter, Lilly and I put out three carrots for the Easter Bunny and left them on a plate on my parents’ dining room table before Lilly went to bed. That night I made sure to eat two and three-quarters carrots and left my best impression of Bunny gnawings in the last quarter left on the plate. I also prepared a perfect little Easter basket stocked with chocolates, jellybeans, Peeps, little toys and, of course, a chocolate bunny, while Elliott questioned how a 2-year-old was supposed to consume that much candy. Then just before bed, I checked to be sure the plate of carrots was properly situated on the table in front of a slightly pulled out chair — at which point I noticed I had apparently forgotten to clean up the mess Lilly made on her chair during dinner and cleaned that up too. Fast forward to the middle of the night when I was apparently dreaming of Easter and was startled awake by the memory that my parents used to also put a little bit of cotton on the chair the Easter Bunny uses to prove that he had been there and was apparently shedding. Then it clicked. That’s what that mess on the chair was! My dad beat me to it! Now having realized that my dad was clever enough to remedy my oversight and I had unwittingly ruined it, I had to fix it. So I got up in the middle of the night, found a cottonball, and carefully pulled just a couple threads of cotton off, strategically placed them on the chair, and went back to sleep confident that I had prepared the perfect Easter morning for Lilly. When Lilly got up in the morning, it was, indeed, perfect. 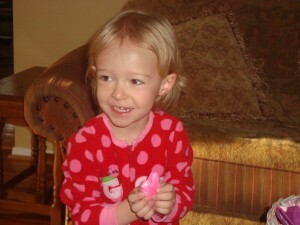 We watched Lilly excitedly find her Easter basket and have (a little bit of) candy first thing in the morning. I was just about to point out the eaten carrots and the remnant cottontail to Lilly when I realized there was no cottontail. What?! Then it hit me that I had just seen my mom cleaning up around us and, yes, picking up that darn lint on the chair. Ugh. I pulled her aside and told her of our comical missteps, but told her not to bother doing anything about it because I didn’t want Lilly to see the plot in action. But not being able to leave well-enough alone — the apple really doesn’t fall far from the tree — my mom disappeared and reemerged with a cottonball in her hand. I tried to give her a subtle “ABORT!” signal in between chit-chat with Lilly but it was no use. By the time Lilly walked over to the table, my mom had not-so-delicately torn the cotton in half and thrown it onto the chair. Proof that the Easter Bunny had been there — and apparently is suffering from mange. Oh well! Lilly was still impressed by the “fuzz” the Easter Bunny left behind and was thrilled to try her first Peep and wear her pretty new dress. And despite its hiccups, I was pretty happy with what we’d pulled off . . . until I saw the horror on my sister’s face when she learned that “the Easter Bunny” had forgotten to hide eggs for Lilly to hunt in the morning. The Cottontail Confusion by MushBrain, unless otherwise expressly stated, is licensed under a Creative Commons Attribution-NonCommercial-NoDerivs 3.0 Unported License. Terms and conditions beyond the scope of this license may be available at mushbrain.net.